expunge our species from the Earth. David Pieri, scientist at NASA’s JPL (quoted in “Mars Beckons”, page 115). The claim that there are fossils on Mars will continue to be denied by most until some are stumbled upon by chance. I presented a paper on this topic at NASA’s JPL in 1994 and it didn’t convince anyone there either. The technology to enable Martian rovers to recover micro-fossils of Protozoa such as Foraminifera and Radiolaria from the sand dunes and send their images back to Earth is already available. The only reason for not doing so is an absence of belief. The last time Earth shared its ocean with Mars may have been considerably less than two million years ago. In a significant event, during one extended and especially close encounter, the two worlds moved to within a few diameters, Earth’s atmosphere distended until it reached the Martian surface, while Earth’s ocean arose in a peak. 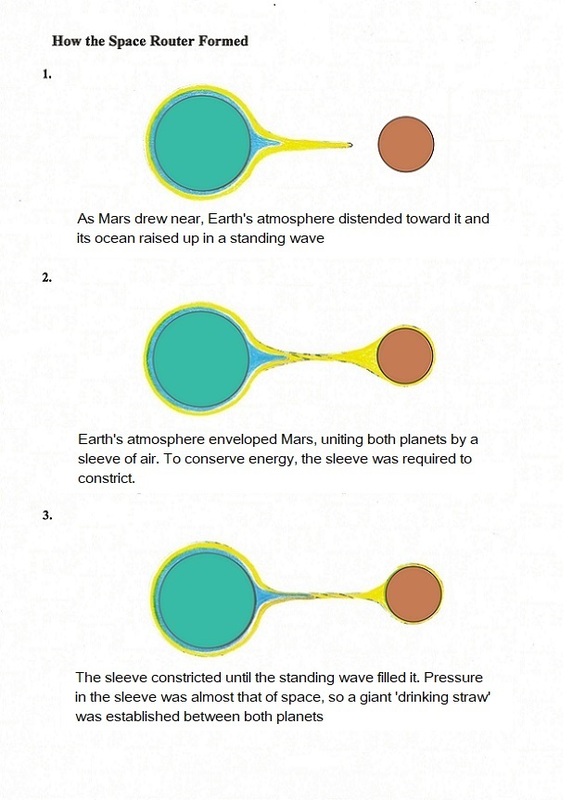 Then the sleeve of atmosphere connecting both planets constricted to a tube. Just as a tornado conserves its energy, it tightened as it rotated. The sleeve narrowed until it was completely occupied by the peak of water at the Earth end. The atmospheric pressure in the sleeve was that of space itself so that a giant drinking straw now existed between the two planets. Water traveled along it, preceded by a vast quantity of air. Even with a perfect vacuum, water on Earth at sea level can normally rise to only about 10.3 meters, less than 34 feet, above the surface. But this involved an almost perfect vacuum in a closed system, drawn along by the contained air. Gravity was partially canceled out, and there is no up or down in space. Dismissing something as impossible is easy, but evidence for the transfer of water from Earth to Mars by some such process is apparent. It would have presented an awe-inspiring sight—a slender waterspout of prodigious proportions arcing through space from one planet to the other. Sunlight flashing off its mirrored surface and through its enveloping sheath of atmosphere, rotating as it approached Mars. A silver filament kilometers across, and thousands of kilometers high smashing onto the Martian surface. Molecules of a fluid cease to flow when its shear limit is exceeded, and upon impact, this water was as solid as the surface it encountered. Spinning onto a surface that was itself moving laterally due to the planet’s rotation, the waterspout had become a monstrous router, blasting away the crust to a depth of several kilometers. The surface of Mars offers clear evidence to indicate water fell from above, and Noctis Labyrinthus exhibits erosional features that do not occur anywhere on Earth. The router divided and roamed about until it arrived at longitude 53 degrees. Then the system stabilized and the stream became concentrated into two principle routers, accompanied by several subsidiary routers, as the great canyon Coprates was blasted out of the Martian crust. With an eerie degree of precision appropriate to some feat of human engineering, but on an incomparable scale, excavation proceeded at a rate that could have exceeded 100 cubic kilometers of Martian crust every second. The extensive Martian sand dunes suggest that the standing wave feeding the space router passed over a continental shelf as Earth rotated beneath it. Perhaps those who ridiculed Velikovsky’s account of Earth’s encounters with Venus and Mars would care to explain how Mars suddenly acquired and then lost, an ocean. Uniformism loses again. I hope planetary geologists, or at least everyone else, will come to understand that large fields of sand dunes on Earth are deposited by water. Later modification of the surface may then be made by the wind. This knowledge will prove useful when the question arises as to how fields of sand dunes formed elsewhere. The canyon named Valles Marineris spans 78o of longitude, suggesting a plausible timeframe for its development. 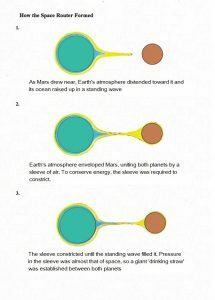 At the present rotational speed of Mars, a point on the equator requires 5 hours and 20 minutes to rotate through 78o of longitude, while at the Earth end the water source behaved as a standing wave, with Earth rotating beneath it. The transfer of ocean water may have ended when the standing wave on Earth that was feeding the waterspout encountered land. Then, after the land had been passed by, the system proved unable to re-establish itself. Valles Marineris displays a gentle S-curve, suggesting changes to the tilt of the rotational axes of the planets during their close encounter. 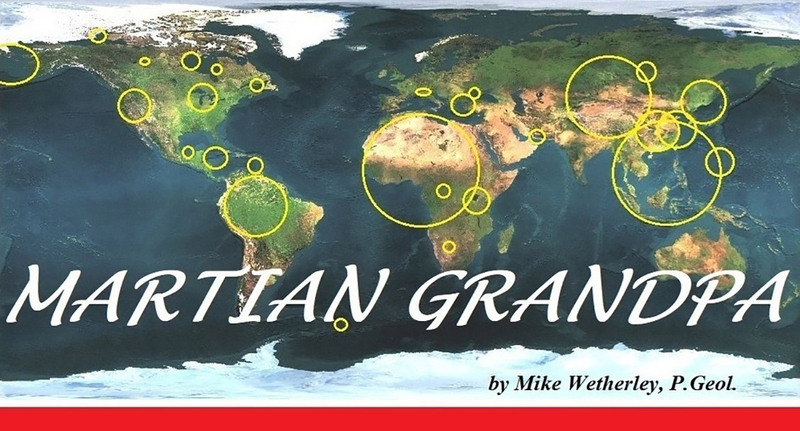 Furthermore, neither of the geographic poles is well centered on its respective ice cap. In fact, the South Pole is situated outside of its ice cap. This is an additional sign of a tilting of the Martian axis while Earth and Mars occupied their conjugal state. As the space router distributed material from the canyons over millions of square kilometers of Martian surface a flood began to ravage the planet. There wasn’t enough water to call it an ocean, but it flowed over the planet from pole to pole. In the absence of mountain ranges and in a gravity that is only 38% as strong as that on Earth even when no other world is nearby, water encircled the globe without pause. It smoothed out the surface, especially in the northern hemisphere, depositing sediment until only the largest craters remained. The polar ice caps rotated beneath the flood, and sediment-laden water cut terraced canyons completely through them to the underlying surface in concentric spirals. Views of both polar ice caps show that the direction of the eroded channels is opposite, as seen from above, due to the rotation of the planet. As water slowed coming off the ice caps, sand settled out to form dune fields similar to many on Earth, while silt remained in suspension and was carried away. While the major canyons were being cut by the space router, others formed by more familiar processes. Beginning at the source end, the main channel is joined by several tributaries so that the overall form is similar to that of many flood channels on Earth. Some small channels have braided forms, while the smallest are often dendritic (tree-like). Along canyons and channels of all sizes, sandy beaches formed in sheltered coves, just as would occur on Earth. The flood channels lead directly to the canyon Coprates, which continues westward for thousands of kilometers. 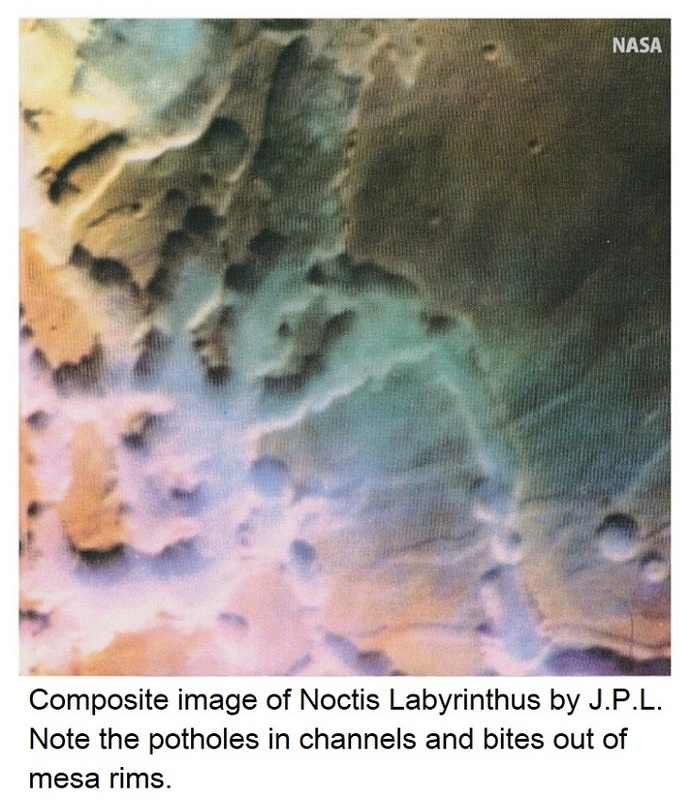 The canyon complex terminates in an area of broken ground, at the apex of the Tharsis Dome, called Noctis Labyrinthus. This raises a matter that cannot be lightly dismissed: If water flowing from the “source area” resulted in the channels and canyons, by what means did it reach Noctis Labyrinthus, which is ten kilometers higher? Does water flow up-hill on Mars? And how much water would it take to erode a canyon two thousand kilometers long, a hundred kilometers wide and 5 or 6 kilometers deep, on a world whose gravity is only a fraction of that on Earth? Water was able to erode the Tharsis Dome because the water fell from above and so was unaffected by topography. This is somewhat analogous to the erosion of the Grand Canyon across the Colorado Plateau. In this case, the water didn’t actually fall from above, but the oceanic flood was so deep that density currents at its base were not diverted by the higher elevation of the plateau. Scientists unaware of repeated axis changes resulting in oceanic floods have claimed that the Colorado River managed to keep pace as the plateau rose slowly over millions of years. Geologists like things that take millions of years. The space router became unstable as its source of water on Earth was cut off, and the reduced flow divided into several smaller routers wandering aimlessly about. Crenulations (arcuate bites) taken out of the cliffs of mesas and buttes by these smaller routers at Noctis Labyrinthus produced a type of landform that has no equivalent on Earth. Sometimes, a router cutting a stream course would double back, momentarily keeping pace with the surface and boring a pothole into the stream bed. It wasn’t only water doing this work. The fluid was a slurry of water and sand, together with larger particles of rock. 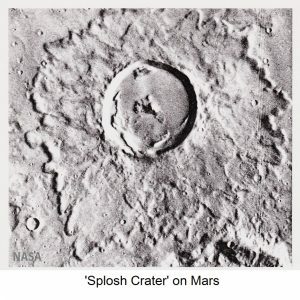 Craters on Mars that are surrounded by lobed, outward-spreading mudflows frozen in place are called ‘splosh craters.’ They resulted from the impact of ejecta from the space router onto the wet ground. Their smooth crater floors do not consist of lava (as some have been described), but of fine sediment. 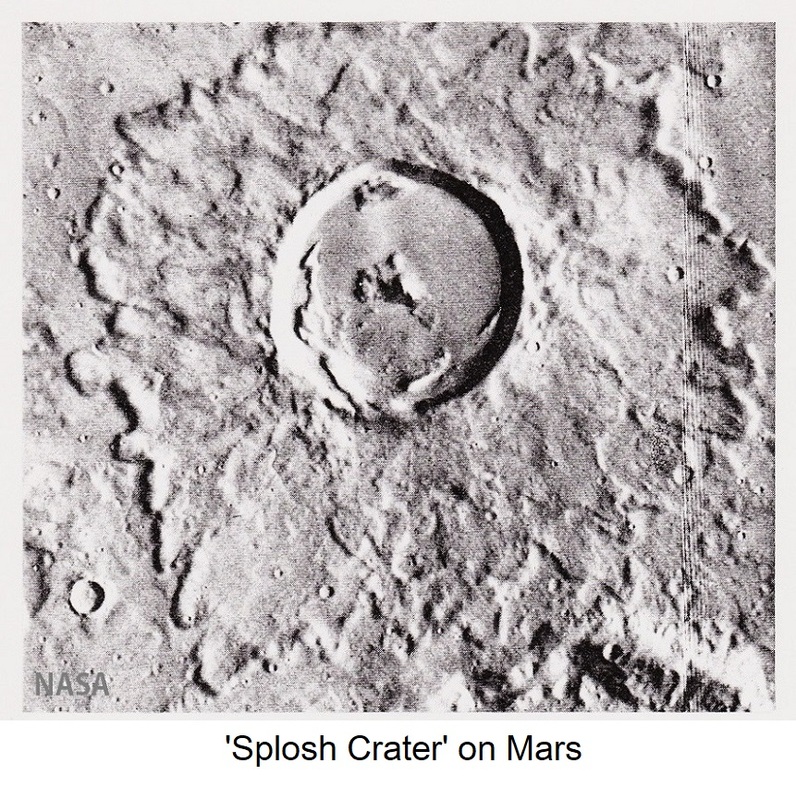 Most splosh craters were formed within the same few hours in which Valles Marineris was formed. Crater frequency reflects history, but not necessarily age. Craters 50 km (30 mi.) in diameter, almost 8,000 km (5,000 mi.) 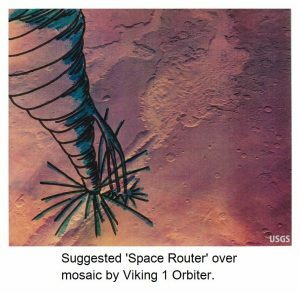 away from Valles Marineris, indicate that large masses of debris from the space router went sub-orbital before impacting at low and mid-latitudes. Some small craters formed after the flood had abated, suggesting that not all of the debris returned immediately to the surface. The largest of all craters on Mars are not associated with the space router but, plausibly, could have resulted from a former moon falling out of orbit to impact the Martian surface. Just as Martian moons cause axis changes to Earth, they could result in axis changes to Mars. It would have been impossible for a significant volume of Earth’s ocean to be removed without including some of the myriad life forms within it. 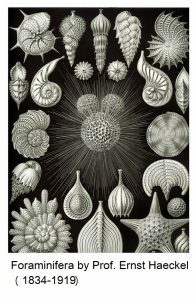 Protozoa such as Foraminifera and Radiolaria (micro-fossils) would have been present in great numbers, while not all higher forms of life could possibly have been excluded. Fish are known to move toward areas of low pressure, which sometimes results in fish falling from the sky when a storm passes by. Dolphins, whales, and even primitive rafts loaded with terrified pre-human refugees, our ancestors, fleeing flooded island or coastal homes, may all have made the trip to Mars. Since Earth entered into a cooler phase at the beginning of the Pleistocene Epoch, it may have taken up an orbit further from the Sun. This could have resulted from entanglement with another world. 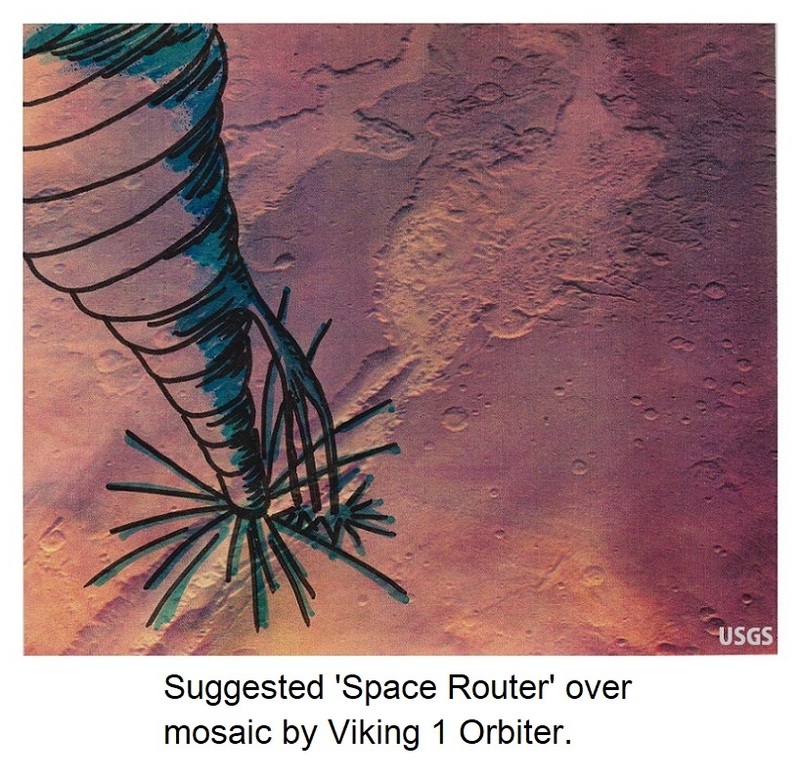 Thus, it is possible that the prolonged encounter with Mars that generated the Space Router took place as recently as the start of the Pleistocene Epoch, which may have been between 1 and 2 million years ago. The discovery of fossils on Mars that came from Earth will constitute proof that Earth has shared its ocean with our sister planet, and the very last vestiges of that decrepit old doctrine of uniformitarianism will have been put to rest forever. 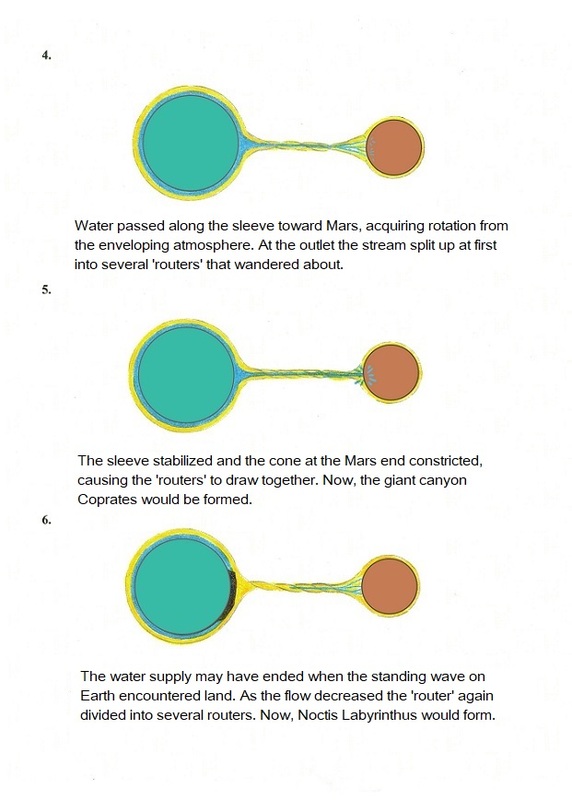 Water flowed over Mars from pole to pole. The flood eroded the flanks of Olympus Mons and the other shield volcanos, as well as the walls of the great canyon Coprates. After its momentum had been spent, water flowing from highlands to lowlands cut meandering channels similar to those on Earth. A geologically young age for the Martian ice caps is indicated by the scarcity of impact craters upon their surfaces. Ice caps are vulnerable to destruction by various catastrophic influences. The vapor pressure of ice is dependent upon temperature, so that ice caps tend to be transitory when they are closer to the Sun than the Main Asteroid Belt, and without any ocean providing precipitation to sustain them. Along with the loss of a significant part of Earth’s ocean was the loss of air, so atmospheric pressure dropped on Earth as well. Some birds could have become flightless as a result, while back in the Mesozoic, pterodactyls would have experienced no difficulty flying in the denser air. Cooler temperatures and thinner air meant that from then on, giants on Earth would live only in the sea. In the face of evidence that Earth has shared its ocean with Mars on two occasions, the question arises as to whether those were the only times. The quantity of water involved each time was large enough that if many such transfers had taken place a requirement would have followed for Earth’s primeval ocean to have covered practically all of the land. Life on Earth would have evolved differently if there had been so much water that no substantial dry land was exposed. Therefore, instances of earth sharing its ocean with Mars must have been few and may have taken place only twice. The presence of the ice caps indicates that Mars received water from Earth during an encounter before the one which formed Valles Marineris. Polar-type sediments occur close to the equator, while distinctive, pitted terrain left by an earlier transfer occurs close to the present South Pole. 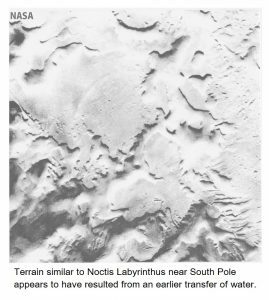 It is not known whether the present ice caps and older pitted terrain resulted from the same event, but this could be the case. On Mars, as on Earth, ice caps form around the geographic poles, but Mars could have undergone an axis change between its encounters. Scientists have attributed the pitted terrain to collapse from the melting of ground ice, or (wait for it!) “…to the wind”. The pits are so similar in their distinctive form to parts of Noctis Labyrinthus that they must have resulted from a similar process. As to what might have happened to all the water and air once held by Mars, there are several processes that may have been responsible. The atmosphere is readily attracted away to a close-by massive body, as we have seen. Water vapor dissociates under intense ultraviolet light into hydrogen and oxygen, and oxygen combines with iron-rich minerals in surface rocks, to form oxides. Water must be especially vulnerable in the absence of an ozone layer in the upper atmosphere. Hydrogen is too light to be retained even by Earth so that Mars would have no hold on it. Since Mars has practically no magnetic field, any atmosphere would be vulnerable to being stripped away by the solar wind. In the explanation of cloud comets, I included this quote from ‘Worlds in Collision’: “A few Greek philosophers were aware that planets, on close contact, are greatly disturbed, and that out of their agitated atmospheres comets are born.” Those planets were Venus and Mars, and I believe the icy tail of Venus provided the material for cloud comets known from Roman times. In addition, Mars may have contributed atmosphere that it had once received from Earth. Some of the carbon dioxide (CO2) in the atmosphere could have resulted from the chemical dissociation of calcium carbonate (CaCO3). Extensive dune fields suggest that the space router carried sand from Earth (grains of quartz from the breakdown of granite). That sand may have come from a continental shelf, which would typically be accompanied by calcium carbonate (CaCO3). If CaCO3 dissociates under Martian conditions, calcium oxide (CaO) may constitute some of the fine dust occurring all over the planet. Sand dunes constitute the most obvious and easiest target to investigate for fossils. If the sand is unconsolidated, which is indicated by the finely sculpted dune surfaces, a fine-grained fraction favoring the size range of certain fossil protozoa on Earth could be readily investigated. Separations based on specific gravity within a narrow size range could be further concentrated by additional means if necessary. There is no shortage of sand dunes on Earth to practice on that were similarly deposited by salt-water, although attributed to wind. Scanning with a low power microscope would be conducted in a search for evocative patterns such as circles, or more complex shapes, and the images transmitted to Earth. The system required is well within the ability of present technology to accomplish and should be given priority over all other NASA and E.S.A. missions. Otherwise, perhaps the rapidly advancing China National Space Administration (CNSA) would like to take it on. 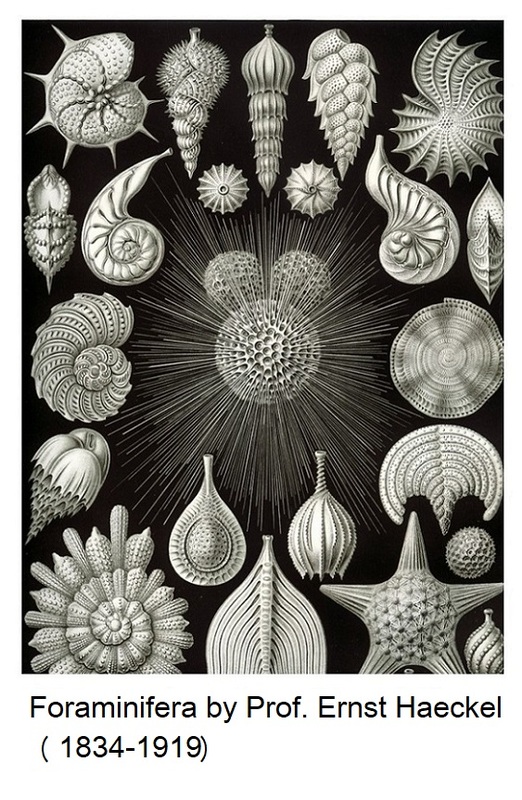 Sand fractions could yield sponge spicules, fish teeth, and other small fossils. Even just determining the composition of the sand grains on Mars could provide food for thought for planetary geologists. Remember, basalt cannot produce quartz grains by weathering. A search for microfossils could also be carried out along stream beds. Cores of sediment obtained with a vibrating drill would be scanned to identify sections yielding anomalous gamma radiation. (Gamma radiation is produced by the Potassium isotope 40K, which is common in clay). Clay-rich zones containing potential biogenic material would be separated for analysis. Samples would be washed and centrifuged, and then applied to slides for scanning under a microscope. Again, evocative patterns would be selected, and their images transmitted to Earth. Teeth and splinters of bone must exist along natural riffles on Mars, and a promising search area could be along channels within the complex known as Noctis Labyrinthus. As riffles are chanced upon, shallow material behind them could be raked onto a vibrating sieve equipped with an air or liquid sprayer and examined. A search for fossils, especially micro-fossils, must precede any consideration of development on Mars. There are fossils on Mars, of life forms that lived on Earth. It is inevitable that bacteria and viruses in the water accompanied more advanced life forms. Some bacteria and viruses have probably persisted around volcanic vents or other favorable locations, and their discovery would not be especially meaningful. There would, however, be some interest in determining differences they may show now compared to their kin that remained on Earth. As had once been the case with Venus, traditions of a day or night of unusual duration came to be associated with Mars in the seventh and eighth centuries B.C., for some encounters were evidently close enough to cause Earth’s axis to tilt temporarily. According to Velikovsky, the final encounter between Mars and Earth took place on the night of March 23, 687 B.C. which was the first night of the Hebrew Passover. A powerful invading army led by King Sennacherib of Assyria had bedded down for the night outside the walls of Jerusalem, prior to launching an attack. That night, most of the army was wiped out by ‘a blast’ as Mars passed close overhead. (Isaiah 37:36). Mars evidently has a lesser electrical potential than Earth, for the lightning bolt jumped from Earth to Mars, and numerous sources are in agreement that it was by “a blast”, accompanied by a terrific noise, that the Assyrian host was destroyed. “Their souls were burnt though their garments remained intact.” (‘Worlds in Collision’) On the Martian surface, close to the face that Mars displays to Earth at its closest point, there should be a ray crater from when King Sennacherib’s army was wiped out. On our Moon ray craters, the product of electrical discharges, have irregular, rounded outlines with very steep walls, significant rock glazing, and rays made of excavated material. Some of these were visited by Apollo astronauts, but all were regarded as impact sites. Livestock in a pasture standing aligned with the direction of current flow through the ground are sometimes killed during electrical storms, even when those with a different alignment are not. This can occur when a sufficient potential difference develops between their front and hind feet, as current flows through the ground. An animal’s body provides a path of less resistance than the ground on which it is standing, and the resultant flow of electricity can result in fibrillation of the heart. Sennacherib’s soldiers lying on the ground as Mars passed close overhead would have been especially vulnerable. Velikovsky wrote (Worlds in Collision’) that this passage “…is described laconically in the Book of Kings…” (My emphasis). Perhaps, but the first “they” (…when they arose…) would refer to the Israelites behind the city wall, while the second “they” (…they were all dead…) would refer to the Assyrians. The threat to Jerusalem had been removed in an instant by Mars “…the perfect warrior…who brings defeat”. These words were written years later by a grandson of King Sennacherib. This was the most recent encounter between Earth and its neighbor, for Mars then retreated to the orbit that it has followed for the past 27 centuries. As a brave new age of exploration is promoted by some of our most intrepid scientists they claim that humankind “must seek greater challenges”. Earth’s present problems have not yet, evidently, become sufficiently noticeable to interest them, and some of them dream of the ‘terraforming of Mars’. This fascination of Carl Sagan would entail nothing less than the transformation of that planet’s atmosphere to a ‘shirt-sleeve’ environment in order to provide a second home for humankind. After Earth has been completely desecrated we, or at least the scientists (in their dreams), could all move to Mars. One could look far before finding a better example of foolishness to confirm my claim that much of modern astronomy constitutes a cult. Only if the planets resided in permanent orbits could the terraforming of Mars make the slightest sense. Given the incredible cost of taking even the first tentative steps towards such a program, an unmanned probe to confirm that Mars holds fossils of life forms that developed on Earth should be especially attractive. It is practically assured that the next time Mars moves from its orbit any development there will be adversely affected, and probably destroyed, including any hapless human inhabitants. So much about our Solar System is misunderstood that it constitutes virtual proof that our species lacks the competence to enable it to spread throughout the Galaxy. If Carl Sagan had been aware that Mars does not occupy a permanent orbit he might have been less seduced by his fantasy of terraforming Mars. If those now lining up to start a permanent colony on Mars knew that in the future Mars will leave its orbit and interact violently with other worlds, including a trip to the Main Asteroid Belt, one supposes that some might be less eager to go. I have been asked if I would personally volunteer to travel to Mars. Although I would not, there are a few special people whom I would be pleased to recommend for the trip. Will Mars ever make close approaches to Earth in future? Yes. The first sign will be a comet approaching Jupiter. Then, if a Galilean moon is displaced toward the Sun, the inhabitants of Earth can expect to encounter challenging times once again. Perhaps the Galilean moon Io, or Europa, will interact with Earth, as Venus did approximately 3,500 years ago. Perhaps the planet Venus will return to once more become a moon of Jupiter, and Mars will pass close to Earth. Even our own moon could depart Earth’s company. Whenever Mars loses one of its present moons (most likely Deimos first, the outer one) to strike Earth, the present geological epoch will come to an end and there is nothing we can do about it. This does not portend the end of humankind, but a reset in human society. My guess is that it would be comparable to the second-last catastrophe of 74,000 years ago, but this would be dependent upon many variables. Mars brings asteroids, as its moons, close to Earth orbit and Earth’s gravity attracts them down upon us. While we regard Earth as our mother, Mars is equally our father, without which we would not be here. Mars is a stern father though, and may ultimately expunge our species from the living record. In the meantime, it is our sacred obligation to every generation that will follow, to treat our planet Earth with more love than we are demonstrating at present. Pollution of our atmosphere may be put right with relative ease. Human overpopulation and pollution of our oceans, however, provide challenges incomparable to any that humankind has ever faced. As for Earth’s climate, it will continue to change as it always has. The only difference this time is that a natural warming trend happened to coincide with an increase in atmospheric CO2 caused by industrialization, and its effects have been misunderstood. The scientific breakthrough in astronomy probably won’t come until the presence of fossilized life forms from Earth is confirmed on Mars. As a first step, I would like to see the sand dunes investigated because they should be easy to sample. There is something else we can do, and that is to reconsider ancient records. Perhaps those smug specialists who dismissed Velikovsky’s claims because he approached science in a different way to them, would learn something. Why is a wealth of records of the Romans, Greeks, Egyptians, Chinese, Mayans and others, accepted by our Historians, Teachers, Writers, and Philosophers, yet summarily dismissed by Astronomers, who have substituted a cult of their own?